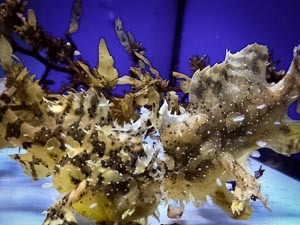 On 13 March, we found three adult frogfish (Histrio histrio) close to the staff jetty, amongst some Sargassum seaweed and a drifting fishing net. We were lucky because one of them was pregnant, so two days later we had a clutch of eggs. The incubation period is short for this species – only two days – so on the morning of the 17th, we had several thousand frogfish larvae hatching and coming to the water surface. 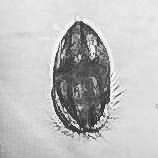 The larvae were very small (2mm) with a relatively large yolk sac, and their development was relatively slow. On the second day post hatching (DPH2) we saw the first pectoral fins develop, and the eyes became pigmented. Due to the large yolk sac, the mouth only opened on DPH5. Unfortunately, the mouth was not large enough to eat any of the rotifers and artemias – our food source in the Fish Lab – so we hope to have better success with the next spawn by using phytoplankton as food. On 25 March, two of the giant clams in our display aquarium released male and female gametes in large quantities. As self-fertilisation is not possible in those molluscs and since they cannot physically move, giant clams have evolved a “broadcast spawning” reproductive technique. 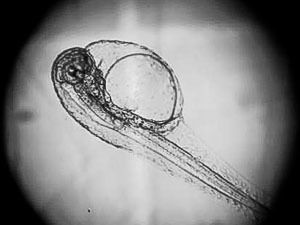 A transmitter substance called Spawning Induced Substance (SIS) is known to help synchronise the release of sperm and eggs, to ensure fertilization. 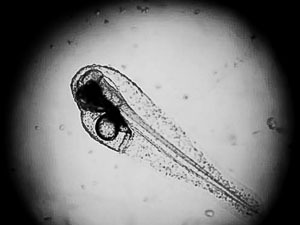 A small fraction of spawn was collected for further monitoring; eggs were seen to float on the water surface for 12 hours, and then hatch the next day releasing many small larvae. According to the literature, the larvae can sustain themselves for the first six days, so on DPH7 we added zooxanthellae (micro-algae living within the giant clams’ tissues). For subsequent spawnings we aim to use an improved water filtration system (under 10µm with UV), and have a food supply of zooxanthella and algae on standby. Seahorses are notoriously tricky to breed in captivity, and we are still experimenting to improve our rearing techniques. At the beginning of the month, we observed spawn being transferred from the female to the male of our breeding pair. A total of 22 hatchlings resulted, but unfortunately most of them died shortly afterwards due to the air bubble syndrome that blights young seahorses. The renovation of the whole water supply system was completed this month. The water quality and flow have been improved by the installation of two powerful submersible pumps, four sand filters, four bag filters and a specialised UV system. Inside the Fish Lab, all the inlet pipes are being replaced with new pipe lines.